You’re bound to have seen the photo.. the cheeky inquisitive grin that has been used as a million Facebook avatars. If you haven’t heard about it – the TL;DR version is basically professional wildlife photographer David Slater (http://www.djsphotography.co.uk/) invested a considerable amount of time and money following a group of crested black macaques on the island of Sulawesi, Indonesia. After setting up his camera gear (a lot more intricate than I make it sound here), a group of the macaques started playing with it – and one monkey, named “Ella”, took this now iconic photograph. Slater discovered the website Wikipedia using the photo without permission or license, and rightfully attempted to enforce his copyright but in a travesty of justice, was declared NOT to be the owner of the copyright in the photograph. Because the macaque triggered the shutter release, and is declared the “creator” of the image. But can a monkey hold a copyright? It has been decided that it can’t – so the image is, so far, not copyrighted [correction: in the eyes of Wikipedia and various lawyers, is not copyrighted]. I don’t agree however. I firmly believe that Slater IS the owner of the copyright in the image [Slater confirms the image is registered with the U.S. Copyright Office, and is therefore copyrighted until such time as the certificate is revoked]. He invested the time, money and effort.. he set the camera in place and made the settings, according to the environment and light conditions. He created the correct environment for the photograph to take place. This photo won the World Wildlife Photographer of the Year 2009 competition, although Rodriguez was later stripped of the prize for alleged infraction of the rules (it is claimed the wolf was not actually wild, but tame). The copyright in Rodriguez’s photograph has never been disputed or challenged. Yet, Rodriguez didn’t take the photograph. He didn’t touch the shutter release, nor did he pick the decisive moment when to take the photograph. 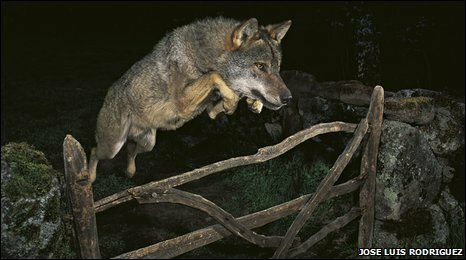 Because he used an infrared trigger, to release the shutter when the wolf jumped over the gate. It was the wolf that triggered the shutter, not Rodriguez. In 2006, National Geographic photographer Michael ‘Nick’ Nichols took a photo of a Serval Cat on the banks of the Salamat River in Chad, which won the World Press Photo of the Year award in 2007. Michael uses camera traps not just to give an intimate and rare glimpse of beautiful wild animals, but to also raise awareness for conservation and environmental issues. Copyright is important to photographers like Michael, and publishers such as National Geographic who often fund and comission many of these shoots, or similar projects that serve a great importance for knowledge and understanding of our planet and environment. If the rights to these works are threatened, then the potential consequences are severe. A lack of funding will no doubt restrict the ability of photographers to reach the destinations, let alone spare the time or maintain the equipment necessary to get there and document ecological issues that ultimately concern us all. Yet the above photo, taken by the action of the cat triggering the camera shutter would, theoretically at least, mean that Michael would lose the copyright to the image, as he did not trigger the shutter. In 2016, the BBC aired a much anticipated sequel to the multi award winning and nominated nature documentary, Planet Earth. One of the most exciting, and highly publicised highlights of the series was the amazing footage of the elusive Snow Leopard in the Himalayan mountains. At approximately 1:50.00 in the above video, you will see the camera team setting up a number of cameras traps, and leaving them, for months at a time. The photographers and videographers were not present during the filming.. they admit that they left the cameras in the remote wilderness for several months “and hoped for the best”… so who owns the copyright to the resulting footage? The BBC rightfully claim copyright – yet the animals physical movement triggered the camera shutter release. If David J. Slater is stripped of his copyright on the basis that he didn’t personally hit the shutter to capture the resulting image, then what rights do the BBC have to the footage created by the snow leopards? What right do landscape photographers have to stunning images of fork lightning cutting through stormy skies, created with lightning triggers? There is, in essence, “prior art” in the question of should the photographer owns the copyright to the Monkey Selfie…. for years, photographers and film makers have taken images without manually triggering the shutter themselves. When the camera is transported thousands of miles, the photographer tracks the subject for days, configures the settings such as ISO, shutter speed and aperture to account for the lighting conditions in that specific scene; when the raw file is downloaded to a computer, captioned, and given post production tidying up before exporting to a file format suitable for publishing – is the photographer not the creator of the image, in the same way the photographers and film-makers are creators and rights owners of images triggered by animals remotely? I’m sure the BBC would insist they are, and I can’t image them giving up the copyright to “Planet Earth II” footage lightly. And also don’t pay much attention to the PETA case, an egregious waste of money from a supposedly charitable orgranisation that squandered thousands of donors dollars on a frivilous case, purportedly representing the monkey in a lawsuit against Slater – the validity of which is brought into question, whether the monkey being represented, Naruto, is the same monkey that took the selfie. Slater claims the monkey was not the male Naruto, but a female called Ella. That case was dismissed in January 2016 yet PETA spent more of it’s donors funds to appeal the decision, which was heard on July 12, 2017 in San Francisco. So, give an infinite number of monkeys an infinite number of typewriters… who EXACTLY owns the copyright to the resulting works of Shakespeare? Here’s hoping common sense prevails and David Slater is rightfully reunited with the copyrights to his work. After my public response to Taylor Swift’s open letter to Apple, I didn’t quite expect the phenomenal reaction it received. I knew it was provocative, I knew it was going to be risky and could possibly harm my chances of getting access to other concerts in future.. but it needed to be said – out loud. When I thought hard about the possible consequences, and restrictions on my access to future work, I asked myself “What point is there in going to work if I can’t be paid for it – yet everyone else gets to benefit from my labour?”. The answer? I have read your open letter to Apple where you give your reasons for refusing to allow your album ‘1989′ to be included on their forthcoming Apple Music streaming service. I applaud it. It’s great to have someone with a huge following standing up for the rights of creative people and making a stand against the corporate behemoths who have so much power they can make or break someone’s career. Some may know that I’m very protective of my copyright. It is extremely important to me, and it’s no secret that I actively protect and enforce it. Why shouldn’t I? I work hard to produce my work, and if somebody thinks it’s worth making use of, then it’s only fair that I should be paid accordingly. In a Utopian society, it might be nice to think that everyone works for free and helps each other, but lets face it – life isn’t like that. The Government tax us, we have to pay to heat our homes and put fuel in our cars to get to our workplace… therefore it’s impractical, if not impossible to genuinely work for free. So, recently I have been testing a new image search engine designed for photographers who wish to call in the lost license fees from their work which has been misappropriated. As a ‘small’ test, I tried a batch of just over 5,000 images from my library. After a few hours, my report was ready, and to my horror, there were over 3000 matches.